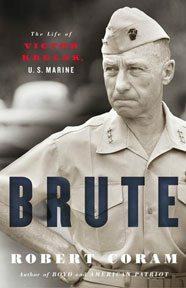 Brute: The life of Victor Krulak tells the life story of a legendary Marine. In his career Kurlak went on spy missions, helped develop and test amphibious landing craft, and executed a successful invasion of Okinawa. Later in Korea he felt the helicopter would be essential and proved it just how useful it could be. Year later as Vietnam raged on Kurlak had Marines connect with the Vietnamese and not declare all of them enemies. While these are significant achievements, the best according to the author, is when Kurlak stepped up to defend and protect the Marines as essential to the military and the people. I like finding books about people I have not heard about before now. Often these life stories are as fascinating as the more well-known historical names we hear about. The life story of Victor Krulak is among the most interesting I have read. Yet as fascinating as Krulak’s life is the author can be heavy on the praise & it wore thin on me several times. This is the only flaw in this otherwise engaging and fascinating read.